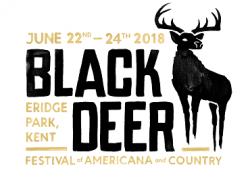 Americana for the masses in Kent, Black Deer Festival is born! A new festival Black Deer has been announced this morning which “promises you a jam-packed weekend of celebrating all things Americana and Country!” Taking place in Eridge Park, Britain’s oldest deer park located on the Kent/East Sussex border near Tunbridge Wells, the festival promises “an array of authentic americana-style meats, smokey whiskeys, bespoke custom bike showcases, storytellings from cultural pioneers,” not to mention the americana itself of course and the line-up is fairly spectacular: Iron & Wine, Jason Isbell, Passenger, Ward Thomas and Eric Bibb among other acts which have so far been announced. Also, they’re doing away with cash on the inside and instead having wristbands which you can upload money to, which feels like the future. You can find more details here – tickets go on sale this morning.